IF you’ve ever bid at an auction, you’ll know how quickly things can get out of hand. One minute you’ve got a sensible €40 in mind for a slightly bockety smoker’s chair, the next minute there’s a competitor. Someone else wants it. At all costs, this enemy must be defeated. Higher and higher you bid, scenting his fear on the wind. At length you secure your prey, and your rival returns to his cave hungry. You have won. You have spent €150 on what, now you look closely at it, is less a chair than a high-rise development for woodworm. Maybe that’s what happened last week, when 67 Upper Leeson Street in Dublin sold at auction for €2.2 million. The guide price was €1.3 million, and three bidders had been snapping at one another’s heels, until a young professional businesswoman suddenly emerged from the undergrowth and ran off with her quarry. Reports said the whole affair took less than a minute. When you want something, you want it. There were two main reactions to the story. This first was a sort of breathy excitement because, even after all that’s happened, we can’t stop ourselves being infatuated by houses worth €2m and the people who can afford them. “An Aga! Cornicing! Suntrap patio! Wonder who she is…” When it comes to property, we Irish are a walking Country ‘n’ Western song. Property is the bad lover that cheated on us, made a fool of us and threw us over, but we’d take it back in a heartbeat. The second reaction was hand-wringing, as onlookers gathered to point and marvel at what looks undeniably like a giant bubble rising over the Dublin property market, and to remark: “Is this really happening? Again? Seriously?” It’s as if the past six years were a nightmare, and a generation of Dubliners woke up to the sound of someone still shouting in their ear: “Quick! Buy now before it’s too late!” Meanwhile, outside the capital, onlookers continued to muse on how long it might take before we too could sell our houses for more than the price of a garden shed. 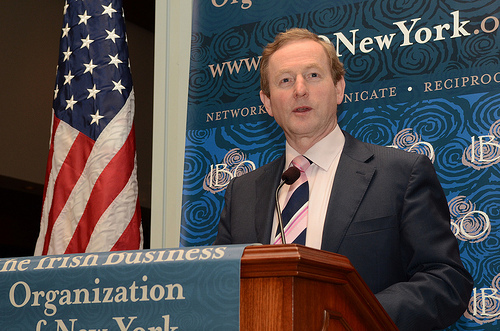 Taoiseach Enda Kenny was over in America talking the whole thing up. “If you had 30,000 three-bedroom detached houses in Dublin you’d sell them all in a week,” he told a New York audience. “That’s the pent-up demand that’s there.” He sounded almost proud, as if a shortage of shelter were a good thing. Property experts later clarified that 30,000 new homes would actually represent about two years’ demand, rather than one week’s, given that only 30,000 homes were sold throughout the entire country last year. But as we know, it is becoming more and more important to attend to what the Taoiseach meant rather than to what he actually said, and with that in mind, the experts fell in behind the gist of Kenny’s remarks. The lie of the land is that property prices in Dublin, which is where the few jobs are, are rising vertiginously. Some people might describe them as “overcorrected” – probably the same people who use “over-refreshed” as a euphemism for falling-down drunk. But average disposable income is falling, and even if it weren’t, the banks aren’t lending. A large cohort of young people has found out – as they knew they would – that a 450-square-foot balsawood apartment in a boom-era tenement isn’t the best place to raise a family, so they want to move. And they can’t. Unless you’re a public servant, it’s probably not worth your while starting the paperwork for a mortgage. Meanwhile, thousands of homeowners are trapped, unable to sell up – not even to find employment – because the price their house would fetch wouldn’t cover the loan on it. And while all this is going on, there is a small cohort of wealthy investors out there snapping up “bargains” all over town. Homeowners and would-be homeowners everywhere can only stand and watch themselves being squeezed out. In response to the property impasse, people are renting their homes now at a higher rate than ever before. This is supposed to be a good sign – it means we’re getting all European about things. John Moran, secretary general at the Department of Finance, this week questioned people’s abiding need for three-bed semis and urged us all to consider renting. Yes, yet another plea on behalf of renting by someone who doesn’t rent. You can’t help thinking the subtext is not that we should all be renting, but that the Lower Orders should be renting. There are several problems with renting, not least of which is that someone has to own all those rented properties, and the idea of creating another wealthy landlord class doesn’t have much appeal in this country, for obvious reasons. And while the banks have shown themselves generally disinclined to evict people who can’t pay for their homes, landlords have no such compunction. In any event, Dublin rents are also rising rapidly, and outside Dublin, where they’re still falling, there’s no work. The government has been working on measures to correct this menacing state of affairs and be seen to have a plan. The aim is to increase the number of houses being built to 25,000 (from 8,000) by 2016, and to generate 60,000 jobs in construction. Some favourable terms for developers are proposed, such as lower levies and a halving of the social housing requirement to 10%. Social housing, it has been decided, is nothing more than a tax on development, and those levies won’t be needed any longer now that local authorities have the property tax, which will shortly be collected from 500,000 homeowners. Developers must be licking their lips. Nama chief executive Brendan McDonagh this week counselled caution in respect of the rise in Dublin property prices, saying that what we’ve learnt from the past is that it’s impossible to predict the future, or words to that effect. It’s hard to know whom the warning was aimed at, though. Was he urging restraint on the part of property speculators? Or was he advising us that it’s not realistic to expect a return to the haphazard egalitarianism of the boom, when anyone from a captain of industry to a forklift driver could end up with a quarter of a million in equity? Not that it matters much. Once a nation of property lovers, always a nation of property lovers, whatever happens in the housing market. You can knock us clean off the property ladder, but you can never take away our right to spend the afternoon poring over other people’s light-filled kitchens in the property pages.